WordPress is getting more and more popular in the world of website building. It has so many benefits for clients to be able to update and edit their website themselves through the WordPress dashboard. 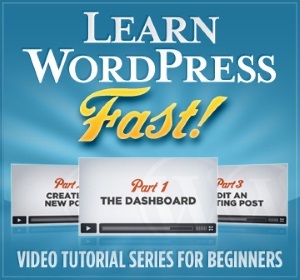 And there are lots of great tutorials out there that will help a person learn everything they need to know about working behind the scenes of a WordPress site. WordPress started out being known for its blogging capabilities, but many businesses are now using WordPress to combine their main website and blog so they are both on one single domain. But is it really necessary to do this? Are there any benefits for a website that uses WordPress? Oh yeah baby, there definitely is! Easy to Use – WordPress is an application that is installed on your web server. You can update your site’s pages, add articles / blog posts, and personalize your theme through the WordPress dashboard which is easily accessed through a special login page. SEO / Optimization – the blogging capabilities can help your website big time with SEO and optimization. And we all know how important that is! A blog allows you to add fresh new CONSISTENT content to your website. Google and other search engines love a site that is updated on a regular basis. And as that old internet saying goes “CONTENT IS KING”. Your articles and posts should attract interest and draw readers in. Also, many WordPress themes are being created with optimization already built in. So be sure to keep this in mind when choosing a theme. Plugins / Widgets – A WordPress plugin is a special tool that extends the functionality of WordPress. You can do anything from add a contact form, a photo gallery, an ad section in your sidebar, or even add connection between your social networks like Twitter and Facebook. The possibilities are endless. There are hundreds or plugins to choose from and they are free too! Here are 2 extensive lists that will help you see some of the ones that are available. Keep in mind that they are all free to use as well. Inexpensive – To me, this is huge. In this day and age many businesses cannot afford to pay thousands of dollars to have a site built from the ground up. But with WordPress, you can get a professional looking website and blog (all in one) for just a fraction of the cost. Click Here to see the WordPress Customization Packages we have available. If you are interested in starting a WordPress site or even moving your current site over to WordPress from html, then please fill out the design form below. We would be happy to help you! Be sure to check out out Terms and Conditions before filling out the form.